"Say the words 'gay cowboy' and chances are the conversation will turn to 'Brokeback Mountain,' the 2005 film starring Heath Ledger and Jake Gyllenhaal, and based on the Annie Proulx short story. The Oscar-winning drama, which is set in the 1960s to '80s, highlighted a long-submerged facet of frontier culture. But as a new series at the Autry National Center shows, the presence of homosexuals and transgender individuals in the American West is much older than the movie might lead you to think. It is, in fact, almost as old as the West itself." The first installment, which took place Sunday at the Autry, was a discussion titled "What Ever Happened to Ennis Del Mar?" The title refers to the Ledger character from "Brokeback" who lived a closeted life in rural Wyoming. Sunday's panel, which included Times film critic Kenneth Turan, was inspired by an exhibition of two shirts [pictured upper left] worn by Ledger and Gyllenhaal in the film that went on display at the museum in the summer. Public interest in the shirts was one of the main motivations for producing "Out West," according to those involved with the project. 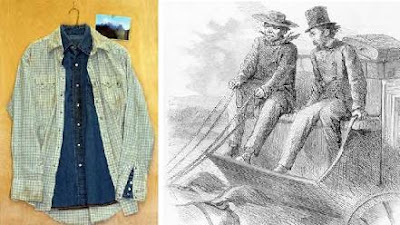 If "Brokeback Mountain" helped to open the frontier's closet door, the Autry is taking the next step by rummaging through the closet's contents and sharing what it finds with the public. One of those findings is a pair of wooden "buffalo" chairs from 1841 that was commissioned by Scotsman William Drummond Stewart. The Autry acquired the chairs in the early '90s but the museum has only recently learned about the history behind the artifacts.